This recipe originally appeared over at Thrive Market. I am sharing this recipe with permission as part of Thrive Market’s Partnership Program. The post includes affiliate links. I am always on the lookout for fun treats that are more on the healthy side than packaged treats. I don’t want chemicals and nutrition in each bite is important to me. I’ve been seeing “magic” chocolate shell all over Pinterest and have been excited to give it a try. I love the ingredients in these frozen peanut butter banana bite recipe and always have coconut oil on hand so this recipe was a no-brainer. You just can’t go wrong with chocolate and peanut butter in my house! Ok…………enough jibber jabber. Let’s get to this recipe from Thrive Market! Chocolate-covered frozen bananas are a summertime classic, but just because it’s back to school, doesn’t mean it’s time to say goodbye. Assemble these little mini pops for a bite-sized after-school treat. 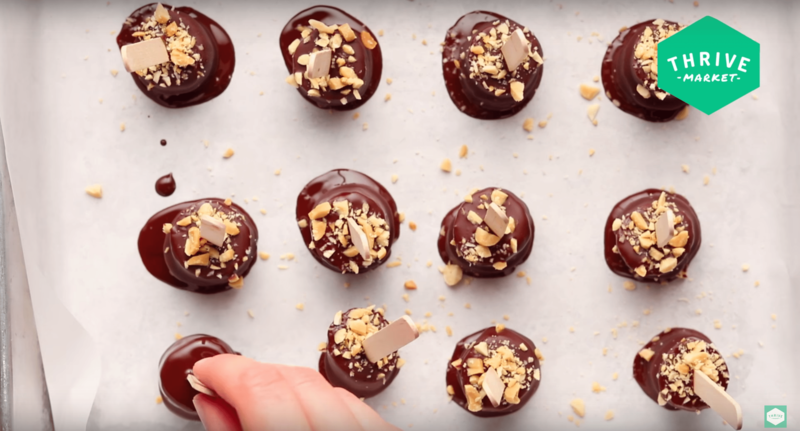 Your little kiddos can even help; making the two-ingredient “magic” chocolate shell is like the best kind of science experiment—incredible and edible. Peel and slice bananas into ½-inch rounds. Dollop 1 scant teaspoon peanut butter onto half of the rounds. Top each peanut butter–topped round with remaining banana slices, then place 1 popsicle stick through each stack, pressing down very gently to avoid peanut butter spilling out the sides. Place on a tray and freeze at least 2 hours. Melt chocolate and coconut oil in a heatproof bowl placed over a pot of simmering water, stirring occasionally. Let cool slightly, then dip banana sandwiches in melted chocolate. Place back on tray and sprinkle with chopped peanuts. The chocolate should harden immediately. If necessary, place in freezer to set. Made with only two ingredients, dry roasted peanuts and palm fruit oil, you can say goodbye to unnatural additives and say hello to this creamy, delicious nut butter. Added bonus is that it’s sourced from all-natural, local ingredients and roasted in small batches to ensure the highest quality peanut butter! Find out how you can get a jar of Justin’s Classic Peanut Butter from Thrive Market for free! Just click over to Thrive Market here for your free jar. As an added bonus, you will get a free 30-day trial membership to Thrive Market. It’s a special deal for all of October! Leave me a comment and let me know what you think of this recipe. Also, please let me know what you like about Thrive Market. Can’t wait to hear from you. This is a perfect recipe to try out with kids. Easy to make and totally delicious!